The extraction of cannabidiol (CBD) from hemp can be achieved through a wide variety of methods. It has been common within large-scale systems, capable of extracting CBD oil from thousands of pounds of hemp a day, to use liquid solvent systems with butane, alcohol, hexane, or ethanol. Liquid solvent hemp oil extraction systems often have lower capital costs but also have drawbacks which can include working with flammable materials and purity considerations with the finished oils. The use of carbon dioxide or CO2 extraction for hemp oil has more recently gained acceptance as a safer and potentially higher yielding extraction method. CO2 extraction for CBD oil is not without its challenges which can include significant upfront costs and more sophisticated process control methods requiring much higher levels of operator knowledge. Regardless of the CBD oil extraction method the first critical step will be the sourcing and preparation of the hemp from which the CBD oils will be extracted. Depending the desired end extracts the source hemp may just be flowers and trim or it could be complete stalk material. 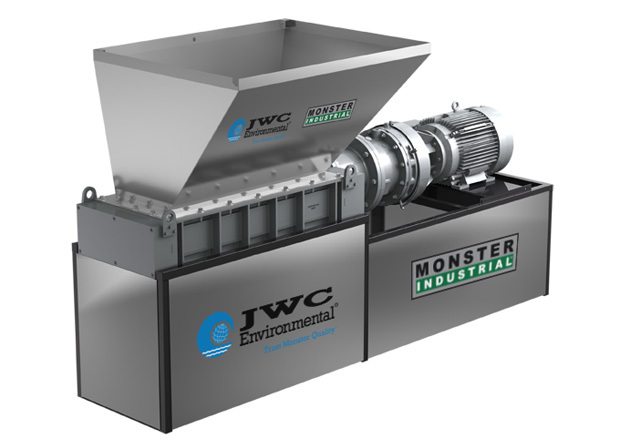 JWC’s Monster Industrial shredders can play an integral role in getting the source hemp ready for CBD oil extraction. Variations in the hemp feed material can present unique challenges during pre-conditioning prior to CBD oil extraction. Depending on the hemp source materials can have unexpected debris from harvest like wood, roots, rocks or other foreign matter. Different hemp strains and packing methods will drive variations in density and moisture content. Finally, the type of materials being used, like flowers and trim versus the full plant can potentially disrupt the pre-conditioning prior to oil extraction. JWC’s Monster Industrial shredders work with two rows of sharp steel cutters that rotate slowly and with incredibly high torque to break down even the toughest solids. They are powered with a quiet and efficient electric motor to grind full hemp plants or flowers and trim to the exact needs of any CBD oil extraction process. Our industrial shredders are designed to grind down wet or dry materials. They also include scrapers for self-cleaning the cutters, preventing unnecessary cleaning and maintenance. Alternate technologies for breaking down plant materials like hammer mills work at high speed to pulverize the hemp by beating it with internal hammers. This type of equipment typically creates significant dust, especially with dried hemp, which equals lost feedstock materials within the operation. The high-speed operation can lead to more frequent maintenance. This equipment can also have an issue handling wet materials as well as hard material. Finally hammer mills are extremely noisy during operation. This creates an unpleasant work environment for the technicians that need to work around them. JWC’s shredders work at low speeds – typically around 60 rpm. This means that there will not be excessive dust produced while the grinder is in operation. Additionally, the shredding of the hemp occurs by the steel cutters moving past each other which results in a much quieter operation during processing. The hemp preconditioning needs of a CO2 extraction process versus to an ethanol extraction process can vary greatly. Our Monster Industrial shredders can be customized to the exacting needs of whatever extraction process you are using. JWC has the flexibility to offer unique cutter sizes combination which can get you the optimum particle size. We will also work with you on the perfect set-up of speed reducers and controls to make sure the feed rates and shredding power meet your expectations. Finally, JWC can offer feed hoppers and stands if required to better integrate the shredder into your oil extraction setup. We realize that the needs of every hemp processing operation are not the same.